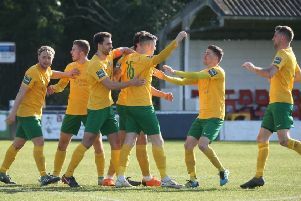 Horsham manager Dominic Di Paola is relishing having his whole squad back available and hopes some consistency will improve their results. Holidays, injuries and a busy schedule to start the season have meant a much-changed side each week. Di Paola levels their shaky start to the fact that they have not been able to put out a settled side - many of whom are already new additions to the club. The Hornets sit 13th in the Bostik League South East division having won just one of their opening four games. They welcome a Herne Bay side, who are yet to record a league success, to Culver Road on Saturday and Di Paola is hoping the tide is turning. He warned, however, “We have not had a great start either. All the players that were away on holidays are back now which means we should not have to keep shuffling the pack. There are no bank holiday games and we can try and get a settled performance with a settled side. To improve, we cannot keep chopping and changing. Chris Smith is back from holiday and while Rob O’Toole was still suffering with a dead leg on Saturday, he is now their only real other injury concern.